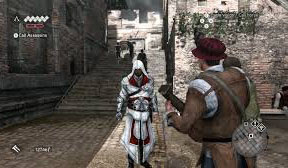 www.dedysoftgame.com - Assassin's Creed Brotherhood is an action and adventure game with a storyline that continues the previous game, Assassin's Creed II in 2012. So you as a player will once again portray the character of Desmond Miles. The plot tells the story of the long struggle between the Assassins, who tried to fight for free peace and the Templars who wanted peace but through control. 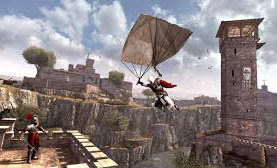 The game that takes the setting of the story in Rome will also feature another character, Ezio Auditore da Firenze. Ezio is an assassin who seeks to restore the glory and government of Assassin while destroying his enemy, the Borgia family. Play also Lego Batman 3 Beyond Gotham. 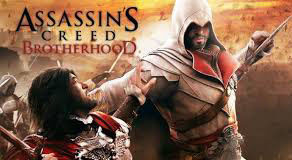 This game will focus on the adventures of Desmond and Ezio with their respective strengths to defeat the enemy. In addition, players can try to recruit other characters to become a new member. How to get a new member is to destroy one of the 12 towers belonging to Borgia while rescuing residents who get disturbed from the guards. The characters you play will also get new equipment such as parachutes that can be used to jump from tall buildings, poisoned arrows, axes, and so forth. You must certainly explore the city and run an existing mission to get rewards. 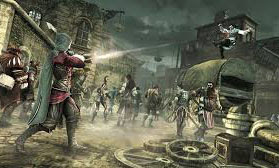 The battle system on Assassin's Creed Brotherhood is made different from its prequel game, in which the fighting style of attacking and defending is now more deadly. His enemies were also more deadly and aggressive than ever before.